Smoky quartz crystal 7 cm long overgrown with rosettes of pink-brown lepidolite up to 10 mm diameter. Three pink rubellite tourmaline crystals are attached along the sides. 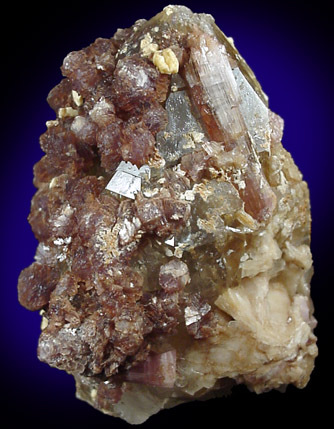 Classic gem pegmatite specimen. Ex. E.W. Shaw collection. Overall size of mineral specimen: 7x6x6 cm. Size of individual crystals: 5-70 mm.